SSC MTS Cut Off 2017 updates: More than ten lakh candidates applied for Multi Tasking Staff (MTS) exam 2017. This article gives a complete overview of expected cut off marks for MTS exam in all regions. Earlier the SSC MTS exams were scheduled to be held on four dates from June 11, 2017, as 'pen-and-paper' mode examination. But with the news of leakage of question papers through social media pages, the first day and second-day examinations were cancelled by SSC. Later SSC announced the re-examination dates from September 16, 2017, to 31 October 2017. The re-examinations were conducted in online-mode as the chances of leaking could be avoided. The advantage of online-mode of examination over traditional mode of examination is that the results could be announced much earlier than the latter. And finally the results of MTS exam 2017 all regions will be declared during December Month. So you can check out our expected cutoff marks for 2017 MTS exam area wise below. Let's get into more details about SSC MTS exam cutoffs 2017 below. Once the cutoff mark for every region is fixed, the list of qualifying candidates for second phase examinations will be announced. The results will be published by late November or by early December. So the figures we calculated is purely based on last years cutoffs for MTS exam 2017. There will not be a significant change during the official announcement. We will also make a significant update on Cut off marks right after getting more details from SSC authorities. At the end of phase 1 SSC MTS examination, cut-off marks will be published. We have compiled all the tables of cutoff marks for each state and region. Check out the cutoff mark applicable to your region for evaluating your result. The cutoff marks are related to the number of vacancies in the region, the number of students who have written exam in the region and also on the difficulty levels of the examination. So let's check out SSC MTS SR region Cut off 2017. The Southern region covers Andhra Pradesh, Puducherry, and Tamil Nadu. The cut off marks for the southern region is given below. If you belong to the Southern region, then you can check your cut off mark from here. Let's have a look at SSC MTS Easter region or ER Cut Off 2017. ER region covers West Bengal, Orissa, Jharkhand, A&N. Check out below. Northern region candidates can check their Cut off marks for 2017 SSC MTS exam here. NR region covers Rajasthan, Delhi, Uttarakhand States. It is essential to know the cutoff mark to evaluate our eligibility for the phase 2 SSC MTS examination. If you are a candidate who belongs to the northern region, you can know your cutoff mark from here. 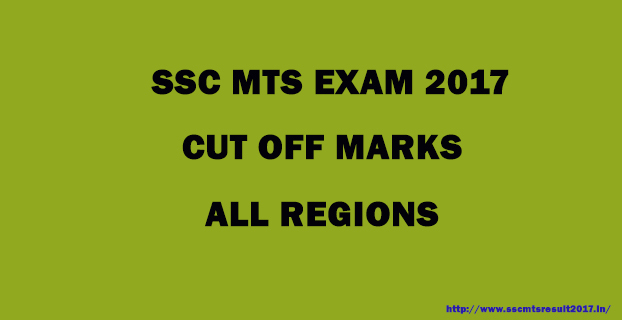 Let's check out SSC MTS Western Region Cut off marks 2017. The areas include Maharashtra, Gujarat, and Goa. Let's check out final cut off mark for MTS central region here. CR region covers Uttar Pradesh and Bihar states. Candidates from Assam, Arunachal Pradesh, Manipur, Meghalaya, Tripura, Nagaland, Mizoram can check MTS NER Cutoff here. Check out below. Get MTS 2017 NWR - North Western Region Cut off here. You can find Haryana, Punjab, J&K, Himachal Pradesh Cut offs 2017 below. Let's check final cut off marks for Karnataka, Kerala and Lakshadweep regions. We are updating Cut off in all categories below. Let's check out below. MPR region candidates can check their SSC MTS cutoffs in all categories below. Note: If we miss out any regions, just comment below, we will update it here. So you all are preparing and working hard to win SSC MTS exam 2017. We have some best MTS exam books for you to read. You can also find your region results and updates here. Hope you enjoyed the article. The next exam of SSC MTS 2017 will be on 28th May 2017. The 1st exam is over now and the afternoon session exam was canceled due to paper leakage. So the re-exam date is yet to be fixed. Stay tuned for live updates from SSC MTS. physicaly abled person cutt off mark not mention here,,, why? girls ki seats reserve rehti he kya,..? unka cut off alag jata he..?